This Vibrant 45 story, blue glass, high rise tower is located just across the I-15 freeway and adjacent to The Harmon Overpass. 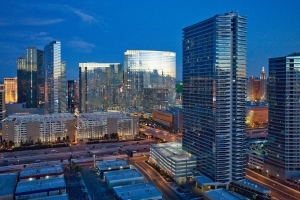 Conveniently located Las Vegas Strip, the Martin is a prominent high rise condominium complex in a friendly family like neighborhood, known for a strong sense of community, the Martin hosts many regular events to promote neighborly camaraderie. From cocktail parties with mixology lessons to weekly film screenings in the movie room, you are sure to become a part of the Martin family in no time, with all the amenities you would expect of a luxury high rise complex while still maintaining a warm, inviting atmosphere to all its residents. The Martin is on the corner of Dean Martin and Jerry Lewis Way this tower is poised for some of the best views in Las Vegas. The high rise offers direct access to the Harmon bridge which brings guests into the heart of City Center. The Raiders NFL stadium is just one mile away down Dean Martin.